Cully Park is not your ordinary park or location. It’s a $14 million dollar, 25-acre outdoor destination for people of all ages. 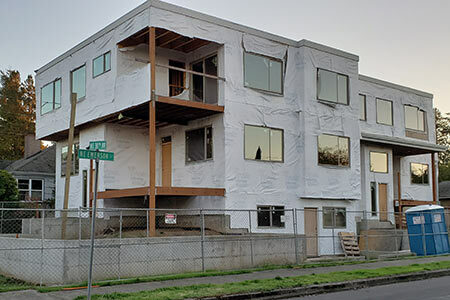 The neighborhood, at 72nd Avenue and Killingsworth Street, is one of Oregon’s most ethnically and racially diverse, according to Portland Parks & Recreation. It is also one of the most park deprived in the state. Its history goes back almost two decades. The city purchased the lot in 2000, in hopes of turning it into a park. But lack of funds put the project on hold until 2008, when nonprofit Verde, a Cully-based outreach and advocacy group, created the Let Us Build Cully Park coalition. Funding for the park came from public and private partnerships. Verde raised more than $7 million in donations from a combination of 50 donors, partners and grants. Portland Parks & Recreation devoted $6 million in system development charge revenues for the park’s construction. More than just fundraising involvement, Verde took a community-based approach to the park’s research and development process. That allowed it to meet ambitious contracting and workforce diversity goals. This generated income for low-income people and people of color, as well as the businesses they work for or own. “We’ve devoted a lot of energy to working with the community on this project and are most excited about how in-depth it has been,” said Tony DeFalco, Verde executive director. “We had existing relationships in the Cully neighborhood, and we developed a bilingual survey to expand our reach to over 1,000 people. Their feedback was incorporated into the design process, construction and workforce,” he added. Verde also worked with 191 neighborhood students to design the play area. That involved teaching them basic design concepts, map reading and calculating scale using an architect ruler. 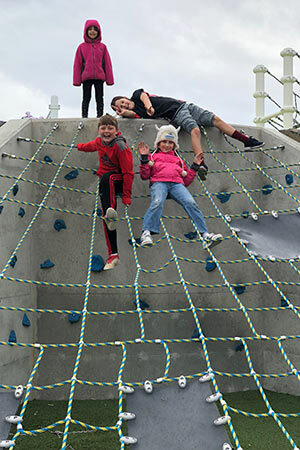 In addition to a youth soccer field and huge play area that includes a wheelchair-accessible sensory wall, Cully Park has a community garden, an off-leash dog area, parking lot, trails, fitness course, overlooks, habitat restoration and picnic areas. Another unique element is the Native Gathering garden, which is the highest point in Cully Park and provides visitors views of Mount St. Helens and Mount Hood. Verde also turned undeveloped 72nd Avenue into a modern green street with flush curbs and an extra wide sidewalk. Passion and practicality are the hallmarks of Calley Dodero’s creations. She’s in high gear preparing for holiday craft fairs. Photo by Marsha Sandman. The season is here for arts and craft shows. 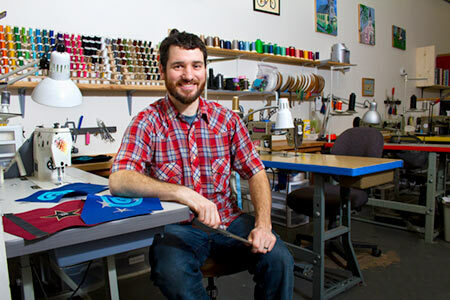 Concordia neighborhood is full of artists, designers and makers. Calley Dodero is one of them, and she converts everyday objects into joyful bursts of magic. In her skillful hands, paper is converted into items of wonder. Her fruitful imagination brings forth ornaments, decorations, masks, jewelry, glittery houses, three-dimensional scenes and so much more. 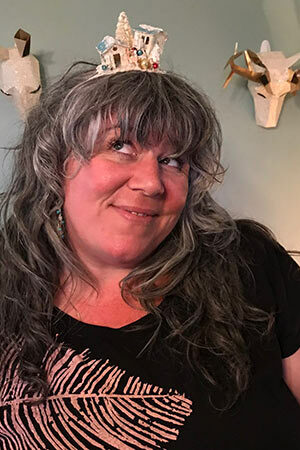 Although some artists are burdened with carrying heavy loads and cumbersome displays into crafts shows, Calley delights in the ease of moving her products to market. She says she usually sells out and always has a great time. Early inspiration came from her parents. “My background is rooted in craft and has been propelled by my parents,” she said. Her father is a ceramic artist and her mother works in textiles. As a child, Calley helped them at craft shows and at the family art gallery in southern Oregon. There she was instilled with a love of craft and design which lead her to work as a floral designer, event decorator, window dresser, paper crafter and jewelry designer. As a compulsive crafter, she worked for seven years crocheting baby accessories and fingerless gloves which sold in stores throughout the Concordia area. After designing a new piece, she will assess how to produce it economically and efficiently with a balance of passion and practicality. She says she appreciates the benefits of being self-employed and working at home with her two kids and her self-employed husband. Plucky Maidens Holiday Fest, Oaks Park, Nov. 16-17. Monticello Antique Vintage Christmas Show, 8600 S.E. Stark St., Nov. 16-Jan. 6.
daVinci Arts Middle School Arts Fair, 2508 N.E. Everett St., Dec. 1. Frock, 1439 N.E. Alberta St. Blithe & Bonny, 4140 N. Williams Ave.
Theas Vintage Living, 1204 N.E. Glisan St.
At a time when people are camping on sidewalks – and the mayor has declared Portland is in a housing crisis – there are potentially livable houses here that are near collapse from inattention. There is at least one residential structure in Concordia that’s not even finished, but may become a teardown. Searching records, talking to city sources, neighbors and a title company turns up seemingly hundreds of clues and many loose threads. The unfinished house is at the intersection of Emerson Street and 38th Avenue. It is ultramodern, looming high above the bungalows adjoining. Work started about four years ago, dragged on slower and slower, then stopped about three years ago. It’s just sitting there. The structure is two conjoined units, each with an accessory dwelling unit. There are four empty electric meter boxes and two offstreet parking spots. The neighbors aren’t wild about the place. Artist Curtis Phillips lives across the street, and he has cultivated a thick hedge to block his view of the structure. If it weren’t for him performing occasional maintenance, the situation might be worse. Curtis is no stranger to the city Bureau of Developmental Services. “I’ve called many times. They seem to feel their hands are tied, and they can’t demand that the owner cleans and makes the place livable or tear it down. Where’s the owner? A search of public records provides little clarification. The listed owner is Julie Selby, whom none of the neighbors have met. A title company notary met Julie when, in May 2015, she made an $865,000 mortgage. The neighbors have met a fellow who identifies himself as the building contractor, Robel Alemseghed. Robel told a neighbor he lives in a house he built for himself on 26th Avenue. Although the address he offered them appears lived in, nobody came to the door despite several visits. In the meantime, the neighbors wait. And wait. “The neighborhood has changed,” Curtis said. “We bought this house 10 years ago, moved back East and returned in 2013 or 2014. We’ve been surprised by changes in the neighborhood. “There’s more traffic and there’s more so called development going on. Shall we consider a digital forum? Perhaps you remember, or have heard about, when neighborhoods used to mean something in Portland. At one point, neighborhood associations in Portland successfully defeated the Mount Hood Freeway proposal. It would have begun at the ramp that juts out into space at the east end of the Marquam Bridge and bulldozed a wide path to destroy neighborhoods on either side of southeast Clinton Street to Gresham. That’s clout, and it enabled the monetary resources allocated to the freeway to instead go toward construction of the first modern light rail line in Portland. The city, on the freeway proposal and others, used to listen to input from neighborhoods, to be swayed by neighborhoods’ advocacy. Nowadays, does a letter on neighborhood association letterhead mean anything? Should it? The city of Portland says it weighs input from individuals equally with that from organizations, that everybody is equal in the eyes of the public process. What, then, is the incentive for neighbors to band together to engage in collective decision-making to advocate what we think best for both our neighborhood and the city? How can neighborhood input be meaningful again within the city’s public processes? Should it? One issue, indeed perhaps the main issue, revolves around physical presence. Everybody is busy. Parents are raising children, and most people are working to pay the rent or the mortgage and maintenance. There are folks who have achieved sufficient stability in their lives to be able to make the time to physically show up and volunteer. And they usually represent just one demographic cross section of their neighborhoods. Should people be required to show up in person to neighborhood meetings for their voices to be meaningful within the neighborhood association’s internal deliberative process? What about attending only periodically? Should the occasionally-voiced opinion carry more, less or the same weight as that of someone who shows up regularly? Perhaps we need to look for more solutions to enable greater inclusivity. Are there various ways for people to engage on their own schedules? Can they do that without having to physically show up to regular meetings to participate in ongoing conversations within the shared forum of neighbors? It seems that, following director Suk Rhee’s visit to Concordia in September, there may be an opportunity to engage with the Office of Community and Civic Life to address these issues. There’s a wealth of technology we might apply to include more voices in the neighborhood association processes. Our task is to decide what, how, within what constraints, and for what purpose. The CNA Land Use & Transportation Committee (LUTC) will examine these and related concerns. We welcome your ideas about how we might meet these challenges to best represent the needs of our entire community. Please email us at LUTC@ ConcordiaPDX.org to share your thoughts, and I’ll include them in a follow-up piece here in CNews. And we’ll let you know, via CNews and Facebook, when the LUTC meetings are scheduled to discuss those contributions and more… and how you can participate. The Concordia neighborhood loves Halloween. There are treats and tricks all over the place. Concordia University (CU) invites families with children 12 years old and younger to its Halloween festival at the George R. White Library and Learning Center Wednesday, Oct. 31. 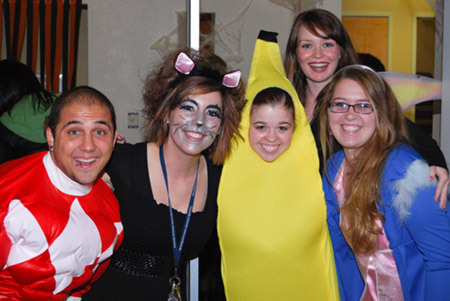 About 140 student volunteers will transform the library into a Halloween carnival with games, booths, crafts, book readings, a coloring corner, treats, toys and prizes. Twelve years ago CU wanted to engage the community with an open campus while it prepares future leaders. Faculty and local businesses are generous with their donations to make sure there is plenty for everyone. Moms and dads have not been forgotten. There will be a coffee corner in the library so you can get a little rest from your more independent kids. From 5 to 8 p.m. assigned groups will be escorted with their parent(s) to the Halloween-decorated eastside dorms where enthusiastic costumed students will dole out the goodies. Upon request, there will be alternative treats for trick or treaters with allergies. There’s nothing scary at this party – all is fun and funny. Dani Deputy-Grobbel is the CU residence life and community standards division director. She talked about this event that is more than just free candy. Twelve years ago CU wanted to engage the community with an open campus while it prepares future leaders. Besides the Halloween event, students are involved in outreach with the newly rebuilt Faubion School and after school programs throughout the community. Last year between 1,300 and 1,500 people enjoyed the safe, dry, welcoming Halloween celebration. According to Dani, CU students are aware their school is mission centered and they understand that, when children come to the college campus, they see what’s possible in their future. Concordia neighborhood hosts two more Halloween events on Wednesday, Oct. 31:Alberta Main Street businesses displaying “Trick or Treat Alberta Street” posters provide treats to costumed children 3:30-6 p.m.McMenamins Kennedy School sponsors Halloween events in the afternoon and evening that offer fun for parents and children. After living east, south, north and west, Marsha Sandman is home at last. And she wants to hear your story. Contact her at MarshaJSandman@gmail.com. Courtney also connects with the federal government to keep elected leaders updated about the work happening around the school district. A lobbyist in Salem hired to move education policies, Courtney works with legislators and representatives of other school districts, school boards and education-focused associations. Their goal is to improve current policy to better serve students and to find solutions to impediments. Courtney also connects with the federal government to keep elected leaders updated about the work happening around the school district. She coordinates logistics if an elected leader wants to tour a program, a school or host a school event. In 2007 Courtney was a grad student in Washington, D.C. She returned home to Oregon and began to work on Jeff Merkley’s successful 2008 campaign. The senator called her back to Washington, D.C. – to Capitol Hill – from 2009 to 2011. Courtney then moved to Michigan and lived in Ann Arbor until 2013. She worked for the Center for Michigan, a nonprofit “think-and-do” tank. 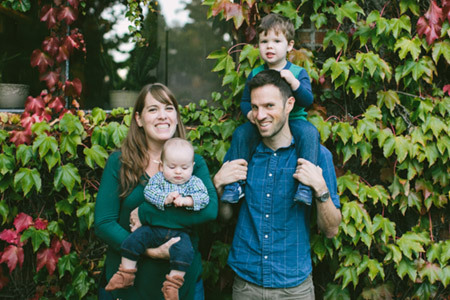 When Courtney and husband Mike moved back to Portland in 2013, they definitely wanted to live in northeast. In October 2014, they bought their house just off of Holman Street at 28th Avenue when Courtney was pregnant with their first child, and they needed room to grow. Courtney and her family enjoy the neighborhood being so walkable. 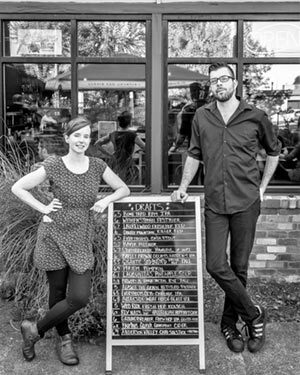 They like to walk or ride bikes to Tamale Boy on Dekum Street or to Handsome Pizza on Killingsworth. They love being close to parks – for sons Evan, 3½, and Graham, 1½, and for French pointer Seger (as in Bob). Portland Public Schools are all in the family. Courtney’s mom attended Faubion School. Soon Courtney’s sons will attend Faubion as well.